KIEV, Ukraine -- Ukraine’s leaders believe Russia is preparing a broad attack on their country, European Commission President Jean-Claude Juncker said Tuesday as he returned from a summit in Kiev that coincided with fresh violence in Ukraine’s east. 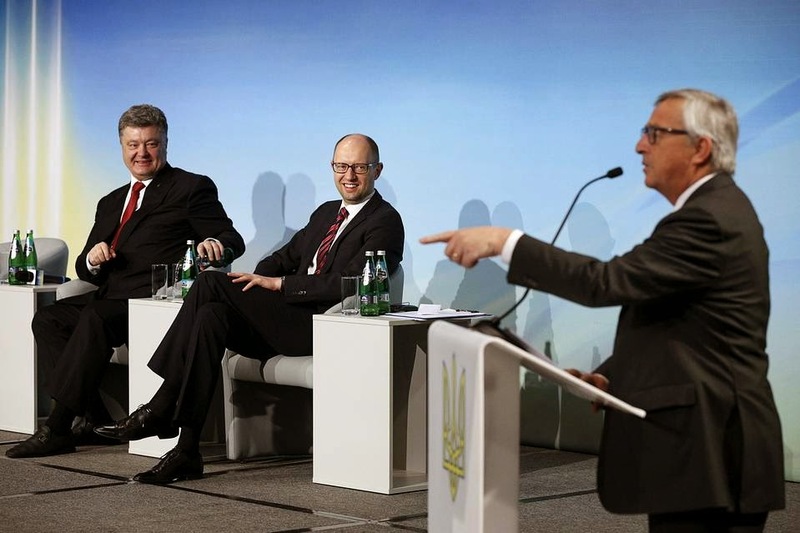 European Commission President Jean-Claude Juncker (standing) delivers a speech as Ukrainian President Petro Poroshenko (left) and Prime Minister Arseniy Yatsenyuk listen during the International Support for Ukraine conference in Kiev on Tuesday. In an interview with a small group of reporters on his flight back from the Ukrainian capital, Mr. Juncker said he had advised the country’s President Petro Poroshenko to ease tensions by avoiding comments on a possible bid to join the North Atlantic Treaty Organization. His advice, he acknowledged, received short shrift. Mr. Juncker said he had no specific information that backed up Kiev’s concerns and cautioned against allowing “self-fulfilling prophecies” to take hold. In the last couple of days, the Organization for Security and Cooperation in Europe has warned of an uptick in violence in eastern Ukraine, where a Feb. 12 cease-fire, signed in the Belarus city of Minsk, was supposed to bring fighting with pro-Russian separatists to an end. The OSCE said late Sunday the heaviest shelling in months had taken place in a town on the outskirts of government-held Mariupol. In a report Tuesday, the group cited heavy fighting around Donetsk airport. The U.S. State Department warned last week of a Russian arms buildup in and around eastern Ukraine. Moscow continues to lie and denies it is actively supporting or arming the rebels. Mr. Juncker said that Mr. Poroshenko and his colleagues had expressed real fears on Monday about Russia’s next steps. “But they were explaining in the more private meetings we had, they are highly alerted about Russia—more alerted than I thought they would be,” he said. “Because they are considering that Russia is preparing a broad attack on the Ukrainian territory.” Mr. Juncker, who became commission chief on Nov. 1, held long private talks with Mr. Poroshenko and Prime Minister Arseniy Yatsenyuk on Monday evening following the summit. Mr. Juncker said fears about Russia’s intentions seemed to be fueling Kiev’s insistence on some kind of international peacekeeping mission for eastern Ukraine. Mr. Juncker and European Council President Donald Tusk said Monday they would send a team to Ukraine to consider options for a new EU mission. They effectively ruled out an EU peacekeeping deployment, however, saying any operation must be purely civilian. The Minsk deal handed the OSCE the primary monitoring role. Mr. Juncker said he did, however, advise Mr. Poroshenko not to talk publicly about Ukraine’s NATO aspirations. When Ukraine’s parliament dropped a nonaligned law in December, Russian Prime Minister Dmitry Medvedev warned of “negative consequences,” saying a NATO bid would make Ukraine a military opponent. Privately, Western officials say Ukraine has no near-term prospects of winning membership. “They saw my point, but they didn’t share my point of view,” Mr. Juncker said of his counterparts. While Ukraine also used the summit to push for progress on discussions with the EU over visa-free access and an eventual path to joining the EU, Mr. Juncker and his colleagues focused on prodding Kiev’s domestic overhaul efforts. The EU has offered Ukraine some €3.4 billion ($3.7 billion) in balance of payments support since early 2014, with around half of that money already disbursed. It says Ukraine could win loans and grants worth €11 billion over time. Some EU member states have openly criticized EU sanctions on Russia, and senior diplomats have warned of damage to the relationship if Kiev fails to implement its side of the Minsk deal. But Mr. Juncker said the EU’s 28 members aren’t “losing patience” with Kiev. “From time to time, we have to draw attention to the obvious need we do see to have huge reforms inside Ukraine,” he said. Mr. Juncker praised what he called the growing partnership between Mr. Poroshenko and Mr. Yatsenyuk, whose political rivalry has at times threatened to stall Ukraine’s domestic agenda. Both are “heavily engaged” in efforts to liberalize the economy, crack down on corruption and bolster the judiciary, he said. “This government is in office for four months and a half and a lot has been done. But more has to be delivered. But my impression is that they are doing the right things,” the commission chief said. In recent months, France and Germany have been the principal European voices in the Ukraine crisis while in Brussels there have been dissonant views. Mr. Tusk, a former Polish prime minister, has taken a hard line on Russia while EU foreign policy chief Federica Mogherini is widely seen as supporting closer dialogue with Moscow. Mr. Juncker, who quit as Luxembourg’s premier in 2013 after almost two decades, has spoken in the past of using a relationship he forged with Vladimir Putin over years to help ease tensions. The commission chief said he believes he still has a good relationship with Mr. Putin but declined to comment on whether they still speak. He said only that he isn’t stepping on the toes of his European colleagues. “We are playing our part in that difficult context, but without shadowing the role of others,” he said.